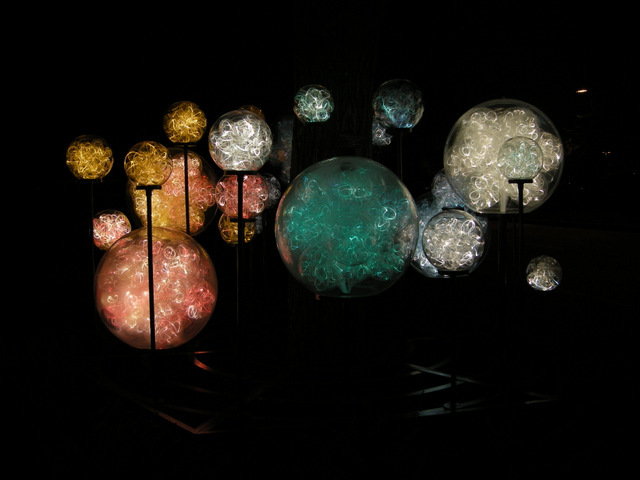 One of the light installations by Bruce Munro. 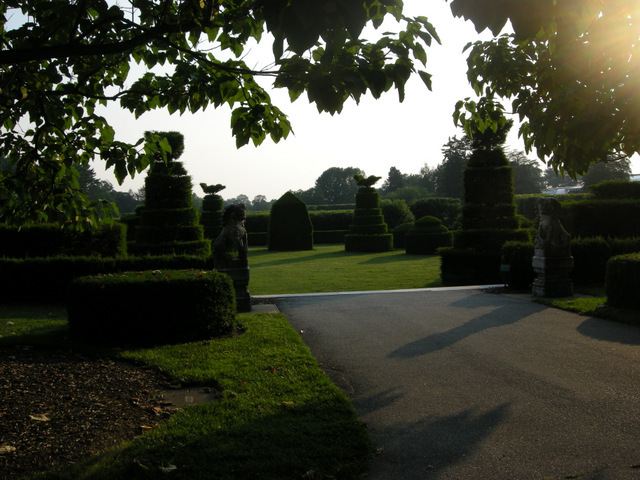 In 2011-2012, I did a series of four posts on Chanticleer, a pleasure garden in Wayne, Pennsylvania, US. These were very popular, and the second, Chanticleer Part 2: Garden Seating, is my most popular post ever by a large margin. I intended to profile another local garden this year but have been slow to choose one. 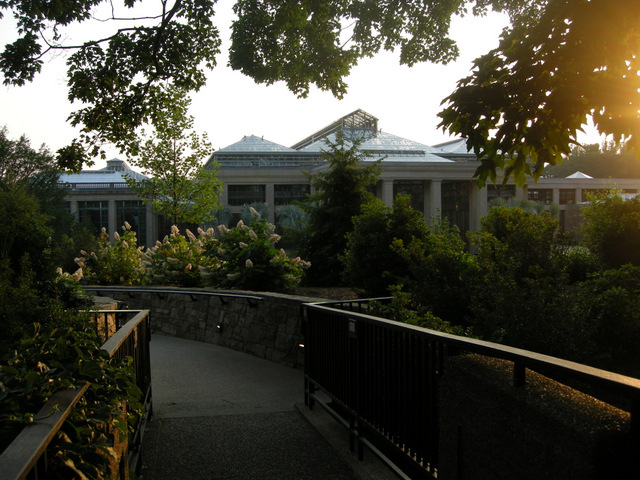 My two recent trips to Longwood Gardens in Kennett Square, Pennsylvania, US, reminded me how much it has to offer so I will be profiling Longwood this year. The sun was getting lower behind the conservatory as we arrived. 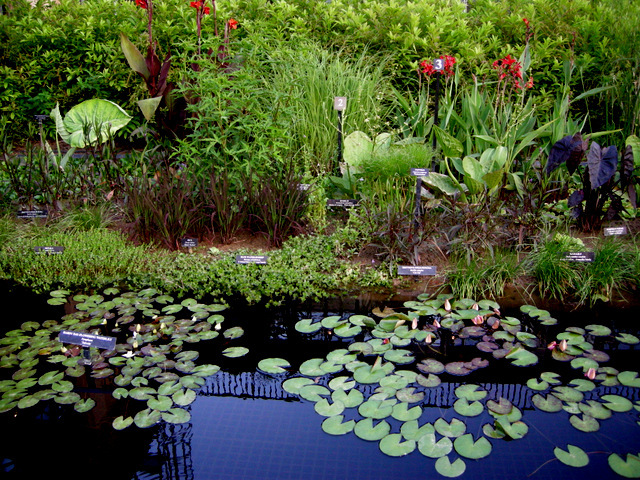 Longwood Gardens is a 1,077 acre public garden with a four-acre indoor conservatory. The property was originally purchased by the Peirce family from William Penn in 1700 to establish a farm. In 1906, the farm was purchased by Pierre du Pont, the industrialist and driving force behind the E. I. du Pont de Nemours and Company, primarily to preserve the spectacular trees. From then into the 1930s, Pierre du Pont created most of what is there today before turning Longwood over to a foundation in 1946. Almost anything horticultural that you would want to see is found at Longwood: extensive native woodlands, a rose garden, elaborate French inspired fountains with shows set to music, comprehensive teaching gardens, majestic conservatories, an Italian water garden, treehouses—I can’t even list everything. 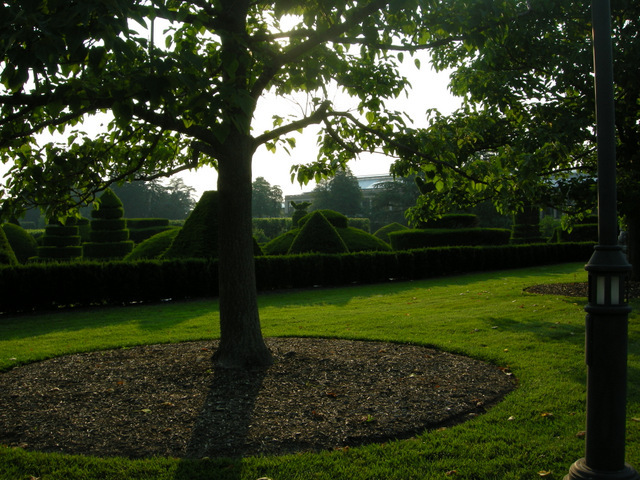 The topiary gardens looked quite elegant with the sun at this angle. In my first post, Groundcovers, Thinking Outside the Box, I focused on the unusual plants that Longwood masses as groundcovers. On my second visit, I took my family to see the amazing light displays created at Longwood by British lighting designer and installation artist, Bruce Munro. We arrived around 7 pm, ate dinner at their lovely cafe with outdoor seating, and toured the gardens as the sun set and it became dark enough to see the Munro installations. The bridge from the cafe to the conservatories. I am not going to say much about the Munro installation except that it is fantastic. It was so much more than I expected, including an entire woodland turned into a painter’s canvas, and I am so glad that I didn’t miss this unique experience. I apologize to my non-local readers but the only good photos I got were of the small entry installations, and they are included at the beginning and end of this post. 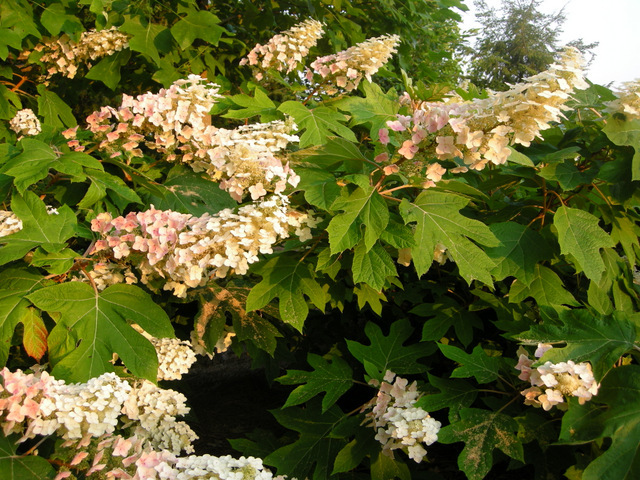 The slanting light of the setting sun on the gorgeous plantings was beautiful: here oakleaf hydrangea. 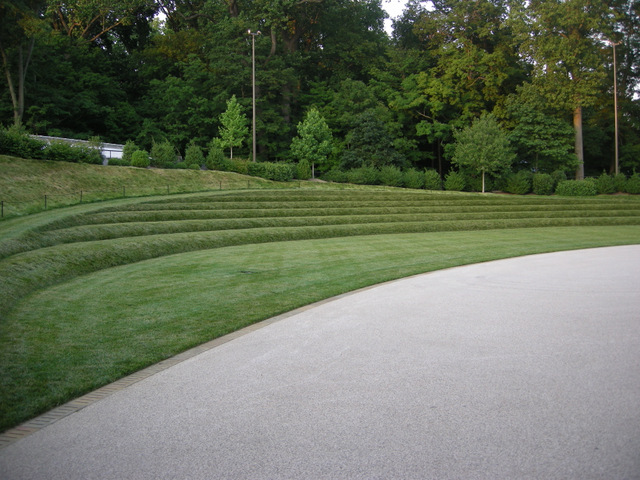 A newly built grass amphitheater. 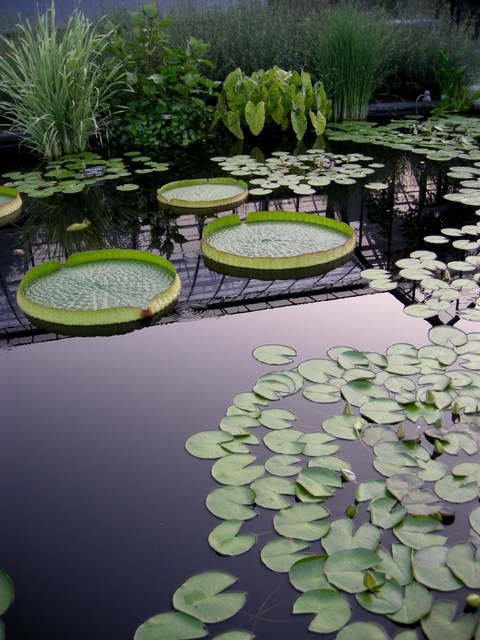 Longwood has elaborate water lily ponds in an outdoor courtyard at the heart of the conservatories. I think they are best viewed at dusk and we spent a lot of time there. Victoria water platters have always fascinated my husband and children. I don’t condone this, but if you lift them up they are covered with spikes on the bottom. A different species of water platter. 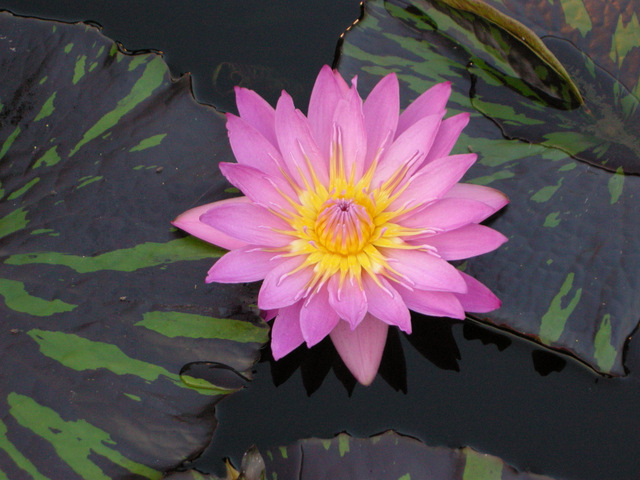 My favorite water lily—look at those leaves. From the water lily pools, we headed to the Idea Gardens which contain large individual areas displaying sun and shade perennials (photo above), annuals, vegetables and fruit, roses, vines, grasses, and groundcovers as well as a charming outdoor children’s garden (there is an amazing indoor children’s garden in the conservatories which should not be missed by children of all ages). In the evening light, this red hot poker looked like it would burn you if you touched it. 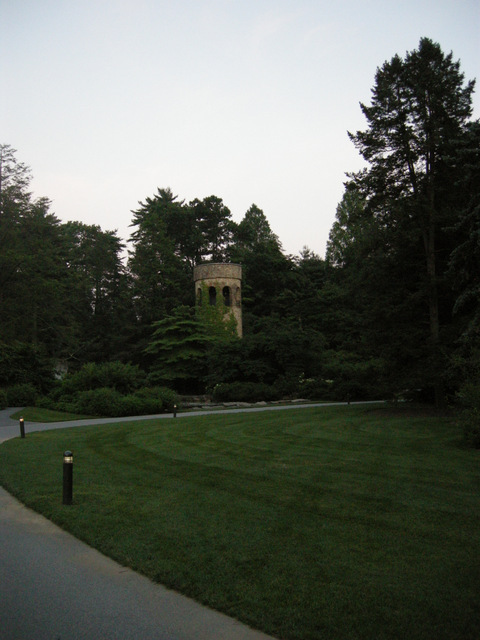 The Chimes Tower which is surrounded by shady woodland plantings and the unusual waterfall called the Eye of Water. The Eye of Water, the source of the Chimes Tower waterfall, glows at night—no additional lighting required. 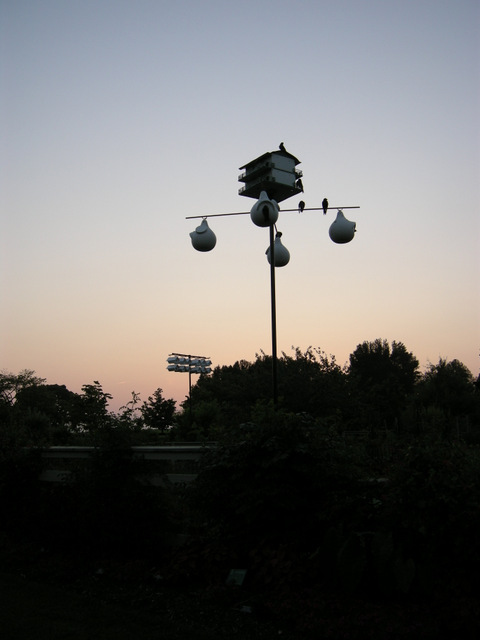 It’s almost time to view the light display: the purple martins are returning home for the evening. This is my only other photo of the Bruce Munro lighting, and it is of the relatively small but quite lovely sculptural installations by the front entrance. Some of the other installations cover acres and need to be seen to be believed. 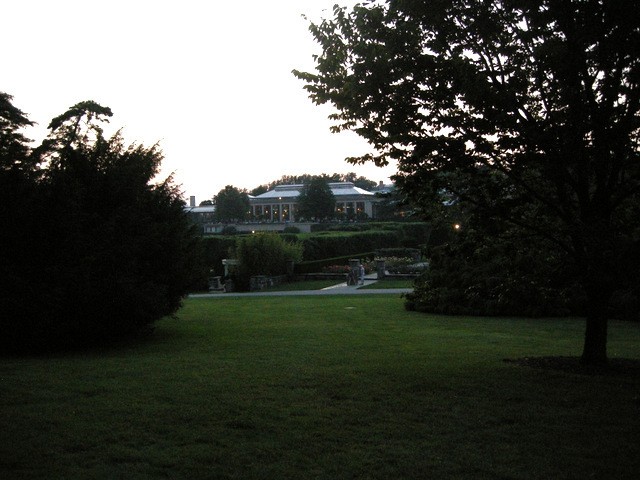 Although you can see a small part of Longwood at night if you attend a musical event or a fireworks and fountains show, both of which I highly recommend, the Munro exhibition invites you to wander over a major portion of the garden at night. If you are anywhere near Longwood, you shouldn’t miss it—now until September 29. This entry was posted on June 27, 2012 at 7:57 am and is filed under garden to visit with tags Bruce Munro lighting installation, Carolyn's Shade Gardens, Longwood Gardens, water lilies. You can follow any responses to this entry through the RSS 2.0 feed. You can leave a response, or trackback from your own site. 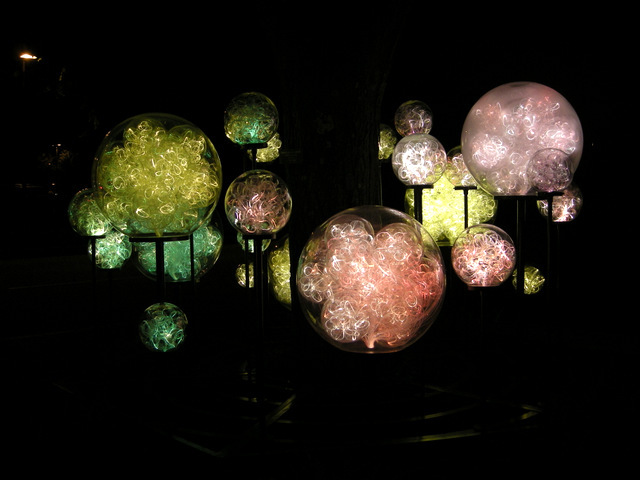 How amazing the lights are in the garden – almost a whole new world! The pond is just so perfect!! Thank you for sharing. It does make Longwood a whole new place to explore even if you know it well. I am glad you enjoyed the tour. I wish I lived close enough to visit here! The only time I’ve ever been in a topiary garden was a long time ago in Europe. That looks interesting to me. 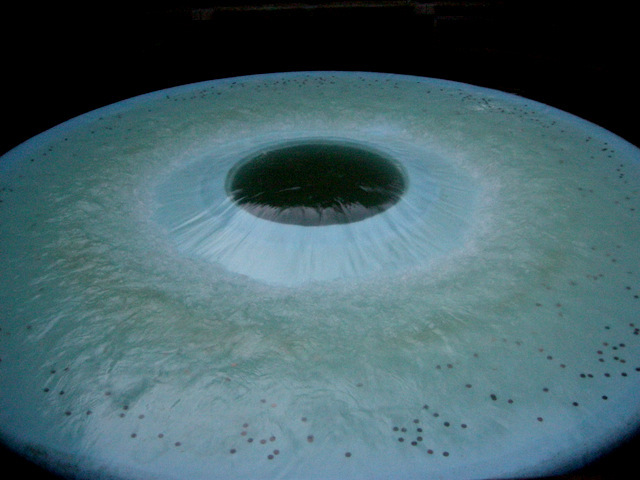 As does the eye of water and the Munro exhibit. What a fun outing!! Tina, You should come visit me on your way to Maine sometime, and we can go to Longwood together. I love Longwood. What a fabulous idea to go at sunset and spend the evening. Thanks for a wonderful virtual tour! I hope you can visit and let us know what you think. Evening light is perfect for most plant photographs, it makes the colour strong and bright. Interesting lighting. I love taking photographs in the slanting light, but i rarely make time to do it. Excellent post – wish I was closer! If only we lived nearer to such a wonderful garden, thank you for sharing your thoughts and photos with us. The Kniphofia positively glows in the evening light and the last photo is just stunning! what a lovely idea- dinner with the family, evening light falling on the planting and the ponds, and then a nighttime display. Always wondered what those large floating leaves were called – platters is obvious! p.s. do you have a pond Carolyn for that waterlily? I very much like their use of night time lighting. It really adds a whole different feel and experience to the gardens. Looking forward to coming back the very end of September. Hope the trees are starting to turn. I hope you can get back to PA in time to catch this installation. I wish I lived close enough to visit this wonderful garden, and especially to see the light show and wander through the garden at night! I bet it was magical! I loved seeing the water platters, and those red hot pokers! 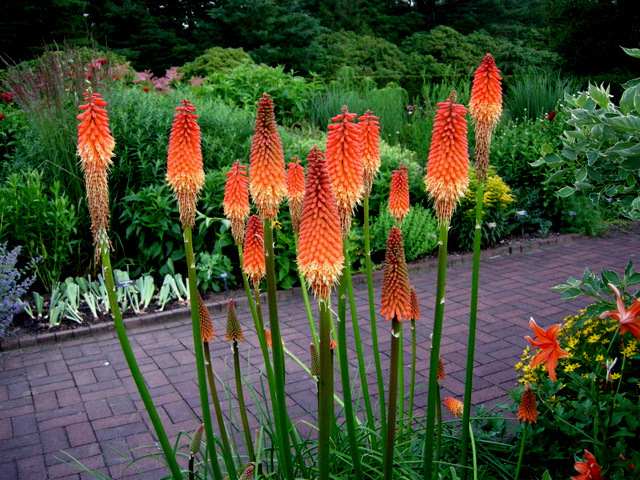 Great shots of the Red Hot Pokers and Longwood at night. 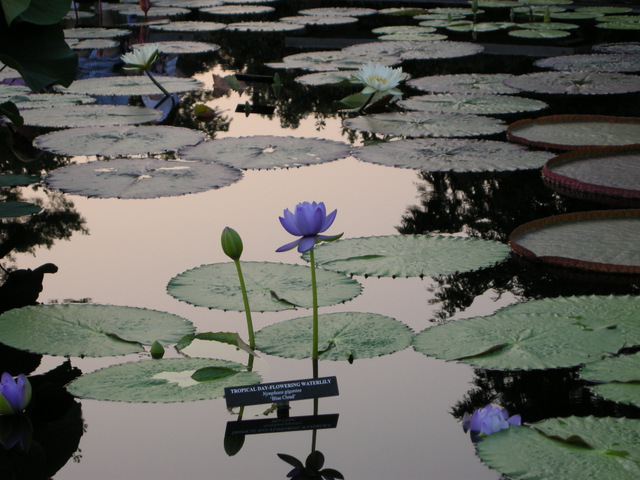 Oh, and the Water Lily ponds would be a must-see. You’ve reminded me that Longwood must be on my visit list next time I’m in Pennsylvania! Beautiful place! 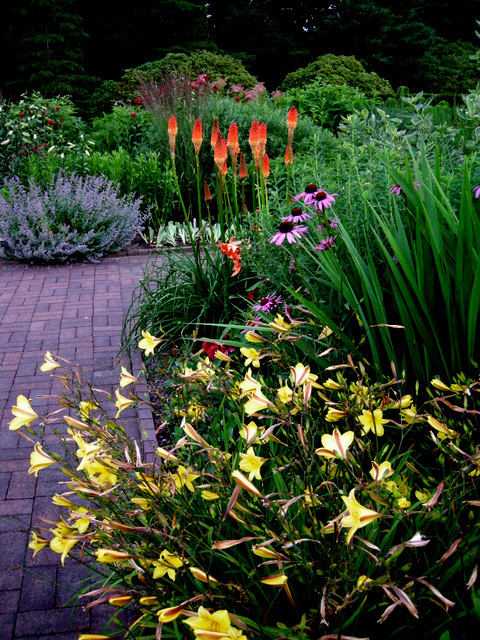 Come to PA and visit Longwood and Carolyn’s Shade Gardens! 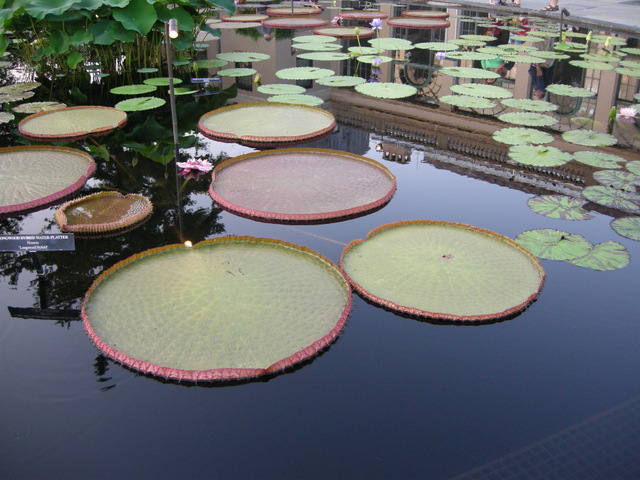 I have seen the garden at night on TV but my I would love to visit day and night…and such a great idea on the solstice….I cannot get over those water lilies and the huge pads…they look like a Disney creation…this is on my must see list at the top…thx for this amazing tour. I thought it was a great idea on the solstice but some other members of the family got tired waiting for it to get dark. Thanks for giving us a peek at another wonderful garden! The personality of a garden really changes at night; the lighting must have made it seem like magic. The glowing Eye of Water, however, is a bit creepy! I guess the eye of water was a little creepy but I liked that having seen it so many times during the day. What a lovely garden, and the water lilies! 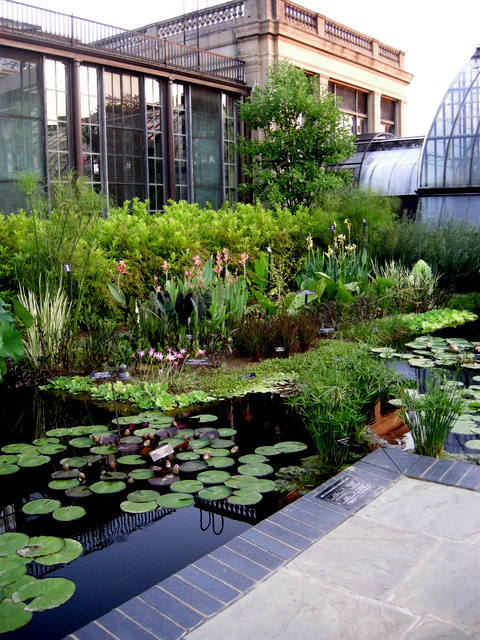 I have visited Kew Gardens here in London and seen the water lilies there, will never forget that – wish I had room for some water lilies in my own garden 🙂 Very nice photos. 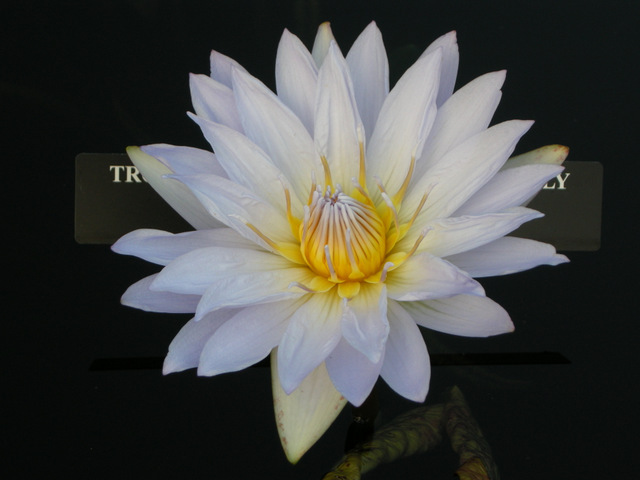 Every time I go to Longwood durig water lily season I come home with an intention to have them in my garden but then work gets in the way. This was so fun to read– Now I know about water platters, which at first glance I took to be something other than organic. Amazing. 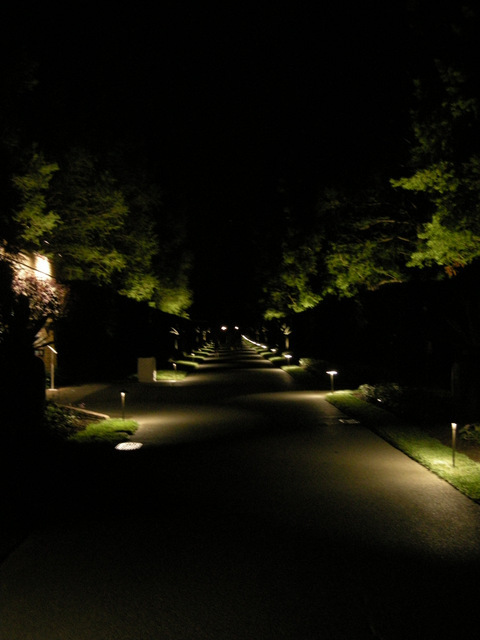 I would LOVE to visit the night- lighted gardens– perfect magic surely. So glad you decided to take us on a tour of another garden. I think in a very rural area so my only way to see gardens like this is on the internet. I had to do a double take of the water platters, I thought they were an art installation at first take. I never would have guessed unless you mentioned that they were real plants! Hi Carolyn, You have touched on a subject that I am very interested in: the garden at night. I once attended a talk by a lighting designer and have been fascinated ever since. The water lilies are so beautiful in this garden. I love that one with the black and green leaves.